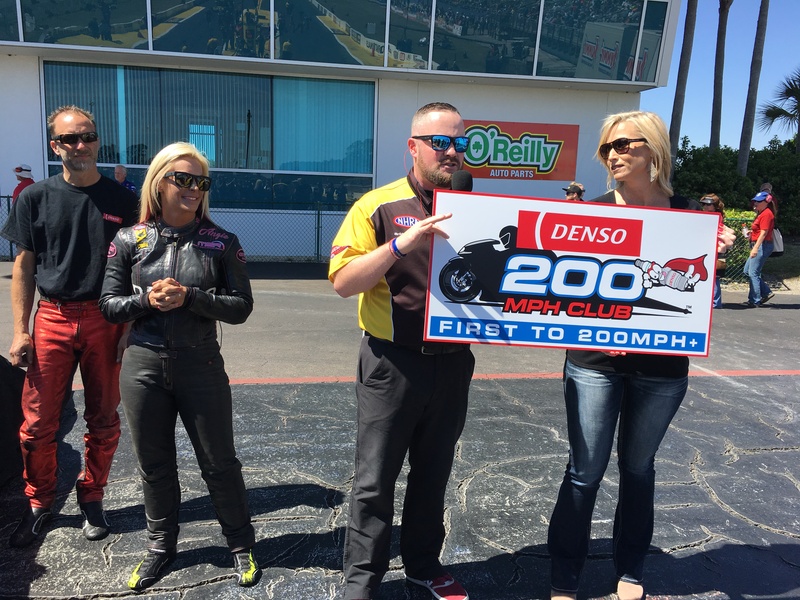 DENSO Auto Parts will expand upon their involvement with NHRA Championship Drag Racing and create the DENSO Spark Plugs 200 MPH Club for racers in the Pro Stock Motorcycle category. This program will honor the first four racers in the two-wheel division who surpass the 200-mph barrier. The initial racer who sets the national record will receive $10,000 and be honored during the FOX Sports NHRA broadcast as well as in National Dragster, NHRA.com, and on all NHRA social platforms. An additional $10,000 will be split amongst the following three riders that join this exclusive club. Bonuses will also be provided to the first four Pro Stock Motorcycle racers, if they eclipse the 200-mph barrier while using DENSO spark plugs. The 200-mph barrier is a milestone many of the teams in Pro Stock Motorcycle have set their sights on and they each long to be the history-making rider. In 2011 Eddie Krawiec became the first competitor to enter in the 199 mph range. The current national record is 199.88 mph posted by Hector Arana Jr. set in March of 2015 at zMAX Dragway in Charlotte, N.C.
DENSO is the sponsor of the DENSO Spark Plugs NHRA Four-Wide Nationals at Las Vegas Motor Speedway, April 6-8 and the primary sponsor of Pro Stock Motorcycle racer Angie Smith and associate sponsor for her husband Matt. Headquartered in Glendora, Calif., NHRA is the primary sanctioning body for the sport of drag racing in the United States. NHRA presents 24 national events featuring the NHRA Mello Yello Drag Racing Series, NHRA Lucas Oil Drag Racing Series and E3 Spark Plugs NHRA Pro Mod Drag Racing Series presented by J&A Service. NHRA provides competition opportunities for drivers of all levels in the NHRA Summit Racing Series and the NHRA Drags: Street Legal Style presented by AAA. NHRA also offers NHRA Jr. Street program for teens and the Summit Racing Jr. Drag Racing League for youth ages 5 to 17. In addition, NHRA owns and operates four racing facilities: Atlanta Dragway in Georgia; Gainesville Raceway in Florida; Lucas Oil Raceway at Indianapolis; and Auto Club Raceway at Pomona in Southern California. For more information, log on to NHRA.com, or visit the official NHRA pages on Facebook, YouTube, Instagram and Twitter.